Joe McKendrick over at ZDnet has an interesting piece on how companies need to look at service-oriented approaches — and what has been learned over the past decade — before taking on cloud projects that could result in further Balkanization of IT resources. After the fighting ends, as we have seen in South Africa, and lately, Liberia, a reconciliation needs to take place. In Ireland, this was glossed over in the peace accords. But many recognize the need to salve what has come before, and move on. If the ending of violence is a prerequisite for political reconciliation in Northern Ireland, the project remains unfinished. The Northern Irish settlement is essentially a consociational scheme; it is not designed to facilitate the fostering of a common perception of citizenship among Northern Ireland's inhabitants. The Democratic Unionist Party and Sinn Féin have agreed to shelve their differences about nationhood for the foreseeable future, but this means that their day-to-day cooperation will always be qualified by the absence of a shared patriotism. When another country's courts (the US, in this case) stirs up the past, there is no method to manage old wounds. Sergey Shekyan, senior software engineer with Qualys, has published proof-of-concept code that takes a different spin on the slow HTTP denial-of-service (DoS) attack sim- ply by dragging out the process of reading the server’s response—and ultimately over- whelming it. This researcher has added the so-called Slow Read attack to his open source slowhttptest tool. Slow Read basically sends a legitimate HTTP request, then slowly reads the response, thus keeping open as many connections as possible and eventually causing a DoS. I love WeatherBug, I won't lie. Crowd-sourced data from my own neighborhood grade school, nice precipitation radar map, and optimized for iPad. Pilots and weather -- goes together like steamed milk and espresso! First thing in the morning, I also like my morning news served up fresh, like my espresso. And I admit, I watch Channel 5 (the local Fox affiliate) when I am in D.C. So I downloaded their iPhone weather app, and was pleasantly surprised by the clean layout, the up-to-date info, and overall functionality. Branding is consistent with the TV channel's web site and on-screen graphics. Does the Cloud contribute to being green? You know by now that I'm a big proponent of cloud computing (and doing my best to promote it). The cloud is a new way to provide and consume services but we often don't know how much energy large-scale data centers consume. The cloud won’t replace existing data centers -- actually just adding to the net number, IMHO. Many cloud services are being provided from existing data center, and there's no shortage of new facilities being built. So we will carry on running old data centers and cloud data centers concurrently. Data center power consumption is a big enough issue that Micro$oft, Google, and others are developing innovative ways to tackle the problem -- not just because they are granola-crunchy, but because saving energy means saving money. One's automobile has special status concerning illegal search, etc. Police may order the driver and any passengers out of the vehicle. If they have reasonable suspicion to detain you, police may frisk the outside of your clothing to check for weapons, but only if they have a basis for suspecting you're armed. If police detain and frisk you, you have the right to clearly state your refusal to consent to the search. They can only search your vehicle if they suspect something, see something plainly in view, or you're being arrested anyway. BTW, I'm not a lawyer, I only play one on... the internet?? At CES 2012, PCs grabbed more of the spotlight than they have for years by focusing all their energy around one new concept: Ultrabooks. Intel, Microsoft, and all the major PC makers were proudly pushing a new and revolutionary PC: the Ultrabook. Yawn. MacBook Air. There, I said it. That's not to say Intel didn't come up with some cool ideas. Glass palm rest that combines touch screen stuff (I know, sorta like the present Magic Pad). Voice recognition a la Siri. It's not that this stuff isn't cool -- it's a bit derivative, that's all. But none of these 'innovativ'e concepts demonstrated by Intel at CES 2012 were available in any of the Ultrabooks that were being unveiled or promoted. As a result, most of what was being shown off at CES was just a bunch of thin laptops. So, the new year in cool PC tech looks to be, well, fairly mundane. To mis-quote an 80s song, I want my, I want my, I want my AppleTV. Can we stop talking about mobile phones and cancer, please? Just wanted to make sure everyone understands. Mobile phones emit non-ionizing RF (radio frequency) radiation. They do not cause cancer. That is all. Noam Chomsky on Ron Paul: Ron Paul's a nice guy. If I had to have dinner with one of the Republican candidates, I'd prefer to have it with him -- but, his policies are off the wall. Want to know what would make the economy better? It should come as no surprise, most small businesses want a decrease in federal spending. 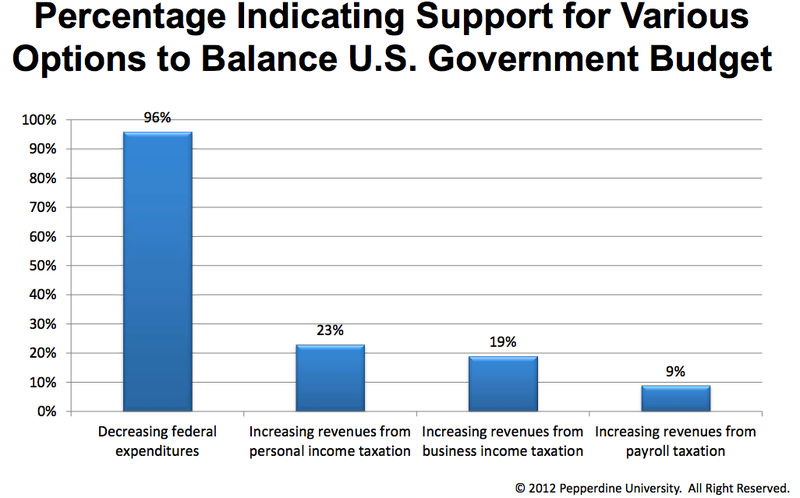 Of course, even conservatives agree government spending can help small business. The Pepperdine Economic Forecast Report 2012 summarizes findings from more than 3,000 small business respondents and includes estimates for employment and GDP growth for 2012 in addition to other useful data. See the PDF for details, or just go their site. Scientists at the University of Alberta have found there are significant differences in the way our brains function depending on whether we're early risers or night owls. Neuroscientists in the Faculty of Physical Education and Recreation looked at two groups of people: "morning people," those who wake up early and feel most productive in the morning, and those who were identified as "evening people," who typically felt livelier at night. "We thought that morning people would be better at this in the morning, but they never changed," said study co-author Olle Lagerquist, a Ph.D. candidate in neurophysiology at the University of Alberta. If you're not quite sure what internet censorship is about, check out Gizmodo's answer to the question: What is SOPA? Also, watch Clay Shirky's Ted Talk: Defend Our Freedom to Share (or why SOPA is a bad idea). Don't let the man (or women) take away our freedoms... in this country, supposedly the land of the free. Pop quiz - is downloading copyright material theft? No. It's copyright infringement. The MPAA and others have engaged in a campaign of misinformation to frighten and bully people. I don't endorse copyright violations, but be clear: if you use Pirate Bay or others to located freely shared digital content, that may *perhaps* be copyright infringement, but it is not theft. Don't take my word for it, I'm only reporting facts from lawyers. Economist Leeson leads readers though a surprisingly entertaining crash course in economics in this study of high seas piracy at the turn of the 18th century. Far from being the bloodthirsty fiends portrayed in popular culture, pirates created a harmonious social order; through the application of rational choice theory, the author explains how a common pursuit of individual self-interest led pirates to create self-regulating, democratic societies aboard their ships, complete with checks and balances, more than half a century before the American and French revolutions brought such models to state-level governance. Understanding the profit motive that guided pirates' actions reveals why pirates so cruelly tortured the crews of ships that resisted boarding, yet treated those who surrendered readily with the utmost respect. Both practices worked to minimize costs to the pirate crew by discouraging resistance that could lead to loss of life and limb for pirates and damage to either the pirates' ship or the cargo aboard. Illustrated with salty tales of pirates both famous and infamous, the book rarely bogs down even when explaining intricate economic concepts, making it a great introduction to both pirate history and economic theory. What begins as another story of pirates soon turns into a voyage through the seas of economics and history. Peter Leeson uses methodological individualism to analyze the pirates' behavior as simple profit seekers. This allows Leeson to give a different view of the Pirates then most of us are used to. He also introduces us to many unknown facts about Pirates, who are a common cultural obsession. I have always thought the British were totally awesome in WWII, standing up to ultimate evil. Even when the odds were against them, and they were on their own. I love stories of how they flipped the proverbial bird to the Nazis whenever possible. In 1941, a Major Alexis Casdagli was taken prisoner by the Germans and sent to a series of prison camps. 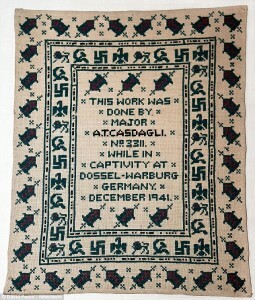 He practiced needlepoint to pass the time; this piece he created in December 1941 looks innocent enough, indeed it looked so innocent that guards allowed him to hang it on the walls at all the camps he stayed in. 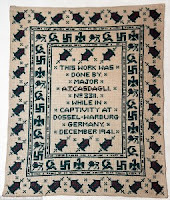 However the piece contains two subversive messages coded into the borders, messages that if they had been discovered by guards would have put his life at risk. The pervasiveness of economic illiteracy never fails to amaze me. Seemingly opposite positions live within perfectly reasonable minds. People readily combine contradictions with such certainty by way of substitution. Faced with a genuinely difficult question, they answer a different, easier question, then conflate the answer to their question with the answer to your question. The greatest obstacle to sound economic policy is not entrenched special interests or rampant lobbying, but the popular misconceptions, irrational beliefs, and personal biases held by ordinary voters, according to economist Bryan Caplan in his sobering assessment in this provocative and eye-opening book. Caplan directly challenges that view by asserting that voters are not simply ignorant but irrational, and that this is in fact predicted by economic theory. Voting is not like shopping - it is more like making use of a commons, because the costs of a "bad" vote are borne by the public at large, and the chance of an individual casting the deciding vote is tiny. Therefore, people will vote for what makes them feel good without bothering to find out whether it really is good - it simply doesn't matter. There's danger in green construction… http://www.usbuildingdigest.com/channels/daily-briefs/health-dangers-in-green-construction. Well, maybe. I pretty much dislike CES, but anytime one can build robots to serve us, I am all for consumer electronics. MeeMo, bringing me my Rob Roy. NO! NO! Not the person, the drink! A good point to consider -- the "Darwinian" nature of Facebook's privacy policies are adequate. Which kind of reminds me of this position -- there is no privacy on the internet anyway, so just deal with it. Amber Case raising an interesting thesis -- technology like social media serves to relieve the isolationism enhanced by the industrial revolution. The rise of the machines may come about due to our inherent hubris, but Case suggests the positive aspects of the tools we've built, and she actively investigates the nature of our relationship with those tools. Case believes we all live in the future. "We're able to touch a button and hear something on the other side of the world. We're able to carry a community in our pockets as we walk down the street," she says. By using anthropological methods to study human behavior and discover how people work, play, share and communicate she's able to make better solutions for users for some of the largest companies. The new year is underway, party hats are put away, the confetti as been swept up. Now is as good a time as any to tackle some big problems. And large data sets can be a challenge. How often is the data accessed? Is caching the right way to go for performance reasons, or is this transactional data, requiring frequent Create, Update or Delete actions? RESTful services that map the traditional WS* approach to GET, POST, and other HTTP actions might help with performance (and portability of code). Perhaps there is one (or more) enterprise application currently utilizing that big data set. Operating across platforms, perhaps even networks, raising different challenges. Are your enterprise apps shunting computational processing off to the database? Is that hurting others' use? One hint: when you audit your business processes, is business logic captured as stored procedures? Shorthand solutions often present the quickest wins — keep data near the end user, for example. With mobile platforms (iPhone or iPad clients, for example), perhaps storing a subset of data on the device, and synching, makes the most sense. For 2012 to be a better year than previous ones, those of us in the various technology sectors must be less protective of IT assets that are commodities, and look aggressively at ways to expand and creatively built upon these assets, rather than maintaining large, complex systems. I call it the 'democratization of technology," the way Steve Jobs brought forth GUIs for the rest of us. For those elements that require unusual thinking and partnerships, I suggest a change in approach -- emphasize focus to ensure that we are not squandering scarce resources simply to be among the first on the block to do something new. Rather, in a world of limited resources, I advise CIOs to be strategic about IT investments, driven by innovation tied directly to the mission of the organization. In rough economic times, seek partnerships to bring down costs and to maximize innovation and reduce risk. The way that was accomplished was to devise a computing environment where information could be shared. Professor Morris, working with IBM, rolled out a network at Carnegie Mellon he predicted would be ubiquitous in the future. The Andrew Project, and within it the Andrew File System, was born. AFS was the first safe and efficient distributed computing system, available to both students and professors on campus. In 1982. Near the close of 1990, Tim Berners-Lee built all the tools we take for granted today for the World Wide Web on the Internet: the HyperText Transfer Protocol (HTTP), HyperText Markup Language (HTML), a Web browser, the first HTTP server software, the first web server, and the first Web pages spelling out the project itself. The browser could access newsgroups and FTP as well, and ran on NeXT computers. The Stop Online Piracy Act is an item of legislation that the entertainment industry wants most desperately, but virtually anyone else with an interest in the internet (isn't that all of us?) opposes. While the bill has bipartisan support, it also has countless critics, there's significant public opposition. Roll Call warned that SOPA could be used to stifle political free speech and shut down entire websites "without any involvement by a court." The current bill would dismantle the "safe harbor" protections of the DMCA, protections that allow sites like Facebook and YouTube to operate without taking responsibility for infringing actions of users, who, after all, are responsible for what they upload. People feel so strongly about maintaining internet freedom, many suffer a backlash for supporting SOPA. For example, GoDaddy reversed its position on SOPA after the company reportedly suffered from the exodus of tens of thousands of customers. David Carr's piece over at the NYT gives a good perspective on this. I'm always on the lookout for new and interesting ways the Cloud is being leveraged, and EdgeBook, a forthcoming securities data service, meets that criteria. With Xignite, the EdgeBook Cloud service will allow compliance officers,traders, analysts and academics to retrieve replays of a given market day and its order book. The GUI will enable slicing of specific segments of historical data to use for back-testing and analysis. In keeping with scalable conventions, accessing data will be totally self-service. Kevin Carrai, Connectivity Services at Direct Edge, says, this approach “...enables us to provide an innovative, valued-added product with a rapid time-to-market." I've been involved in knowledge management and data mining since the 1980s, and relish the thought of inexpensive data analysis tools on the web, available to anyone -- the democratization of information continues unabated, thanks to andTBL. 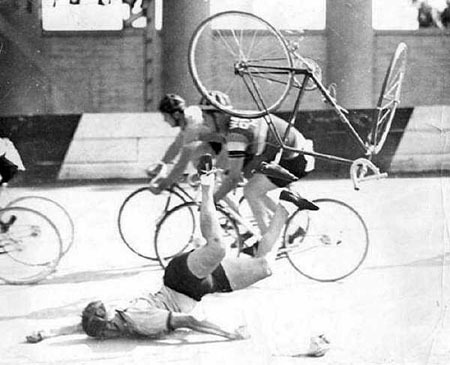 Poor behavior by cyclists gives us a bad name. And, of course, jeopardizes safety for all. This study in Portland, Oregon puts numbers to what we have anecdotally observed -- frequent running of traffic lights, stop signs, ignoring pedestrian safety, etc. Incidents of bike crashes go under-reported. Leah Shahum of the San Francisco Bicycle Coalition says its group's 2001 study concluded that police neglect to report bicycle incidents. Out of about 40 injury cases called in to the coalition's hotline, officers didn't file reports one-third of the time. One of my favorite resources for bike safety has lots of tips, tricks and plain old good advice for keeping us all safe on the road, together. As 2011 ends, the year ahead should be a banner year for the continued growth of cloud technologies. Technology research analysts at Gartner have predicted that, by 2012, 20 per cent of businesses will rely solely on software as a service (SaaS) solutions for their IT needs. Ventana research confirms that organizations are moving to the cloud now and will accelerate the pace of doing so in the near future. At least 20 percent of five different line-of-business functions use cloud-based applications, and within 12 months at least 40 percent of eight of nine functions will. Dell is putting $1 billion toward the cloud over the next two years in the form of data centers, customer service outposts and new solutions. The company announced it would spend that amount over the next fiscal year building multiple eco-friendly data centers around the world for customer access to outsourcing capabilities and public and private cloud technology. As software-as-a-service matures, for example, we will see more commerce (local, national and global) as a result of the internet. And that's a happy new year, after all.